Short Business Description: Childcare Service - Registered Childminders in New Mills. CACHE Level 3 HBCA, Paediatric First Aid trained, Ofsted registered. EYFS Framework delivered. We are wife and husband team Joanna and Mark Jones and we set up Springbank Childminding Services in October 2016. 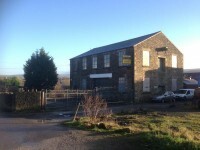 We are based in a very convenient part of New Mills; close to Sure Start Centre, Arts Centre, Parks, Library, Leisure Centre. We hold CACHE Level 3 Home-Based Childcare Award accreditation and we are both trained in Paediatric First Aid as well as both being Ofsted registered. We offer a happy, friendly and homely environment. Childcare business. We also have a good sized back garden which is securely enclosed. We have a substantial amount of resources and toys available which allows us to accommodate all ages and stages of a child's development. With these resources we can provide opportunities for children to have a choice of free play and we are guided by the individual interests of the child. As registered Childminders, we follow the Early Years Foundation Stage (EYFS) Framework. This covers the stage of children's development from birth to the end of their first (Reception) year in school. We offer planned and themed activities which incorporates the latest EYFS areas of the learning guidelines and we provide daily ‘All about me’ diaries which shows parents how our daily activities link back to the EYFS. We spend time outdoors (weather permitting) and we go outside to play as often as possible. We also have Class 1 business insurance on our vehicle which enables us to provide transportation such as trips out or school / nursery drop-offs & pick-ups. Our working hours are 08:00 to 18:00 Monday to Friday. We are flexible either side of these times to accommodate early starts or late finishes. We also offer weekends and Bank Holidays. Short Business Description: Caring for your horse and pets requires time, love and quality horse and pet supplies. At Torr Top we believe in providing the best quality horse and pet feed andequipment for every situation from a comfortable riding experience to caring for your horse’s health. We stock an extensive range of riding tack including bridles, bits, saddles and numnahs as well as a vast choice of horse rugs such as turn outs, quilted stable rugs, fly sheets and coolers covering your horse’s needs all year round. Have a browse and order online or alternatively speak to a member of our team on 01663743032 who’ll be happy to help with your horse riding equipment, accessories or horse care supplies questions. We offer a vast range of horse, cattle and pet feeds, feed supplements, grooming supplies, rug repairs and much more. You can park either on our car park or on Victoria Street New Mills and we’ll carry your goods to your car. We have a free delivery service within 5mile for all your feeds and bedding, all you have to do is order 2 items or more, pay over the phone or when we make the delivery. Inbox or phone the shop on 01663743032. Torr Top Equine & Pet Supplies. • Free delivery within 5 miles of our shop in New Mills, orders with a delivery address outside of 5 miles should contact us before placing an order. • We will contact you prior to your delivery to confirm a time slot/date. • We only deliver Saturdays. • Please ensure the correct delivery address is supplied and any additional information included when ordering your goods, we’ll need your contact number for arranging delivery. • Payment should be made over the phone or when goods are delivered. • Payment can be made via cash, cheque, when ordering on the phone. For all your equestrian clothing and equipment. Whether you’re new to the equestrian world or an experienced rider, a top level competitor or simply ride for pleasure, you will find everything you need for you and your horse. Here at Torr Top we have thousands of products to make your riding experience enjoyable and safe, for both you and your horse. This includes our extensive range of equestrian equipment and riding wear from all the leading brands, including the season’s latest styles and all at great prices. We also have a large range of horse rugs - something for each season, whatever our unpredictable weather has in store for us. We also aim to bring you the highest levels of service and this is all backed by our impressive delivery service, so you can order with real confidence. Have a question? Speak to one of our team on 01663743032. Short Business Description: Proofreading, copy-editing and plain-English editing services. I offer professional editing and proofreading services to businesses, charities, organisations and individuals. I have more than 10 years' experience, and I'm an Advanced Professional member of the Society for Editors and Proofreaders in the UK. My background is in communications and the not-for-profit sector, in particular housing, disability, digital inclusion, community outreach and older people. I specialise in copy-editing and plain-language editing. I can help with reports, evaluations, policies, newsletters, marketing literature, website text, contracts, tenders, strategies, leaflets, brochures, information for the general public and academic work (for example, journal articles and PhD theses). I'm happy to mark up Word documents or PDFs, whichever is most convenient for you. I can also edit web text from within content management systems. Please visit my website for more information, or contact me to talk about your project in more detail. Short Business Description: Safe, fun & reliable pet care in and around the High Peak. 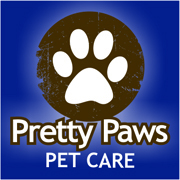 Pretty Paws Pet Care offers an array of services including dog walking, doggy day care, puppy visits, cat visits and equine care. We understand that every animal is different and strive to offer a tailored package to suit you. Pretty Paws Pet Care strive to offer a fun, safe and reliable service. Our aim is to offer a home from home experience tailored to each individual pet. Pretty Paws want to treat every client as a VIP. That's Very Important Pet! We want your pets environment to be comfortable and relaxing whilst you're away on holiday or simply out at work. Each and every animal we look after will receive a total unique service tailored to their needs. This service will include a free initial consultation to make sure the Pretty Paws bond is made; we will offer as much professional care and advice along the way, tailoring the perfect package, ensuring that your pet is well looked after and receives nothing but the best treatment within the High Peak. We want the Pretty Paws bond to last forever. Our expanding portfolio of clients currently includes many types and sizes of animal. It has built up over time across all of our services we offer. We now have 4 dedicated staff and 2 vans patrolling the High Peak to ensure all our clients are treated to the highest of standard. Check out our Facebook page for the most up to date pictures and reviews of our service. Whether you have a dog, cat, horse, rabbit or even a bird, Pretty Paws Pet Care will take care of all your pet care needs. We are always on the look out for new clients, so if you are thinking of pet care, Pretty Paws is the professional service you need. Renew your existing windows/doors to the latest energy efficient options. Want more security? I also sell a range of composite doors. Upgrade your existing glass to a more energy efficient one. Old windows can be in good working order, so it may be more cost effective to replace the glass only. I can do repairs to doors, handles, broken hinges etc. We sell, repair, upgrade and buy computers, laptops and mobiles as well as tablets, printers and much more. Repairs undertaken whilst you wait - professional, affordable and convenient. 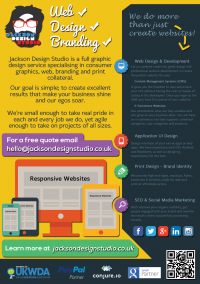 Short Business Description: Jackson Design Studio is a full graphic design service specialising in consumer graphics, web, branding and print. Based in Derbyshire & Lancashire. We're a full graphic design service specialising in consumer graphics, web, branding, and print collateral. Our goal is simple; to create excellent results that make your business shine and our egos soar. We're small enough to take real pride in each and every job we do, yet agile enough to take on projects of all sizes. Errands and all other household tasks undertaken. Braulio Ramos Language Services Ltd.
Short Business Description: Tranlation, Interpreting, voice-overs, proofreading, Tuition, etc. Translating, Interpreting, recording Voice-Overs, Proofreading, Teaching, etc. for 31 years professionally. Involved in many prestigious projects. Recorded several voice-overs in Spanish, some you can see on my website and on Youtube.